Analysis with the C-ROADS simulator shows that most all (94%) of the emissions reduction required to hit mitigation goals for 2050 will happen after 2020. Put another way, the necessary post-2020 results are fifteen times as much as pre-2020. So, here in Copenhagen and in 2010, 2050 proposals really matter. Here in the halls of COP15, 2020 goals for country emissions are dominating the conversations and negotiations. We strongly support a “meaningful start” to emissions reduction. However, C-ROADS analysis also indicates that, when it comes to long-term climate outcomes, commitments to emissions reductions in the period beyond 2020 are extremely significant. 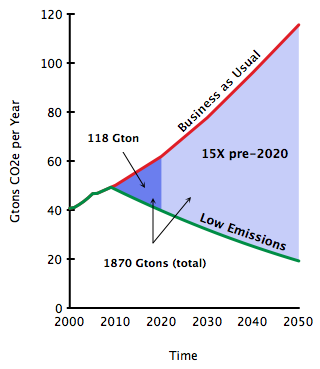 In our calculations, between 2009 and 2050, 1870 gT C02 equivalent that would be emitted under a business as usual scenario must not be emitted if the world is to achieve 50% reductions in emissions by 2050 and be on track to the goal of limiting temperature increase to a mean of 2°C or less. Of those ‘avoided emissions’ only 118 gT must be avoided by 2020; the remaining 1751 will need to be avoided in the period from 2020 to 2050. The 2020 proposals analyzed in several reports show that the gap towards reducing those 118 gTons by 2020 is close to achievable — indeed this is good news. But it is good news regarding 118 gT out of 1870 gT, good news on the first 6.3% of the work ahead of the negotiators and the world.